We’ve had quite the influx of activity out on the SW corner of Stellwagen Bank the last two days! Today aboard the Aurora’s 10am trip, we arrived at the corner to find an estimated 15 humpbacks kick, bubble net, and open mouth feeding! As well as a few Minkes, and many Cory’s Shearwaters, Great Shearwaters, Northern Gannets, and gulls in the area. Our trip started out with excitement as we found Rapier’s 2009 calf kick feeding with high splashes and lots of energy. This whale didn’t appear to be using bubbles, but at one point made one huge single bubble under the water. And after each time it would feed, Rapier’s 09 calf would do a slight spyhop out of the water, so we were able to check out the barnacles on the chin! Great to see this whale feeding well. It endured a serious tailstock injury as a calf, but overtime the injury has healed. There is a however a bit of deformity it the tailstock. 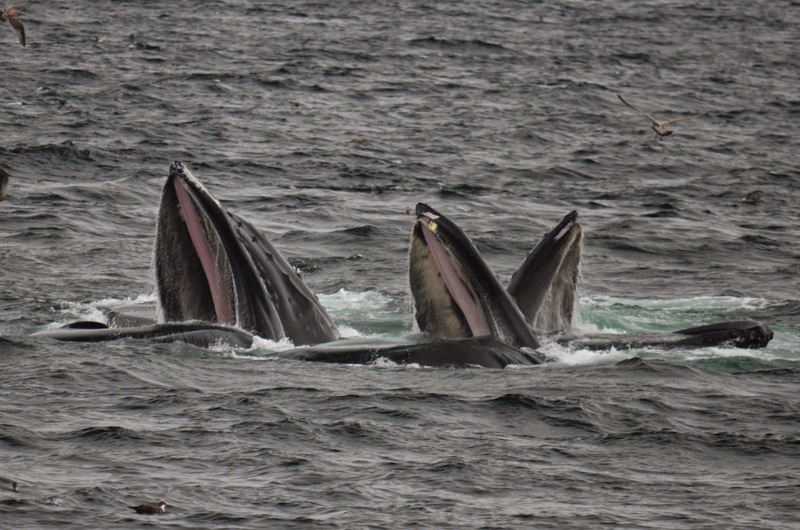 After watching Rapier’s 09 calf for a while, we moved on to the many blows in the short distance, which turned out to be a scattered feeding frenzy of humpbacks! Our first group consisted of Milkweed, her calf, Pleats, Piano, and Storm. At different points in time – we saw great displays of kick feeding from Piano, Storm, and Pleats – and we also saw great big open mouths from Milkweed and Pleats as they worked together to bubble net feed (see photo). You can see in the photo that Milkweed has a fresh bottom feeding scar on her mouth – we actually saw a few recent bottom feeding scars – makes sense as these whales have been busy feeding all season. But it’s very exciting to see so much open mouth feeding over the last few days! Speaking of open mouth feeding – Milkweed’s calf was joining in on the feeding action today! Looks like this calf is starting to wean – we saw it feeding open mouth alongside mom (see photo), and creating some of its own bubble nets right in front of our boat! 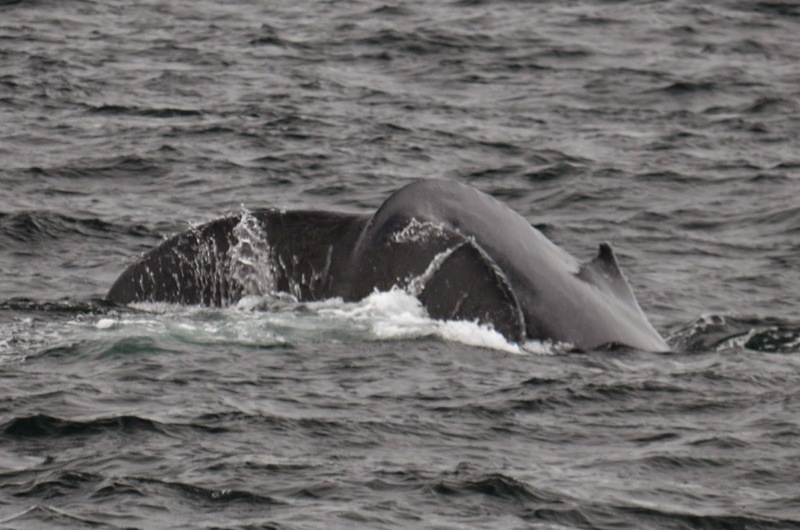 This calf gave us some great close to boat looks feeding, rolling, and fluking (see photo). As stated in an earlier blog – we did observe Milkweed’s calf appear to get entangled, and then free itself, in fishing gear yesterday. From what we observed, this whale seems to be gear free today – and we have sent our photos to the Center for Coastal Studies in Provincetown, as we continue to monitor this calf. We moved from this group to find another group of three bubble net feeding – Perseid, Aswan, and Apex. Perseid’s calf wasn’t seen – but with how independent it’s been lately, it doesn’t surprise me! At this time of the year we sometimes see calves wean/separate early from their mothers. This adult trio was fantastic to watch – all three would come up at the surface with big 90 degree open mouths, from different directions feeding very tight-knit. Each time they would come up in the same pattern – and we got great looks of their feeding (see photo). If you look closely in the photo – you’ll see a small sand lance trying to scurry away in the air! We also spotted Pitcher doing some kick feeding, and wrapped up our trip with one final look of Rapier’s 2009 calf, who was still kick feeding as well. We had another amazing day on the water, seeing all three species of whales in addition to a Mola mola! We passed a cruising fin whale as we approached the bank, but moved on to an area where we found three separate groups of feeding whales! Timberline and another humpback, both kickfeeding, were the first group we spent time with. 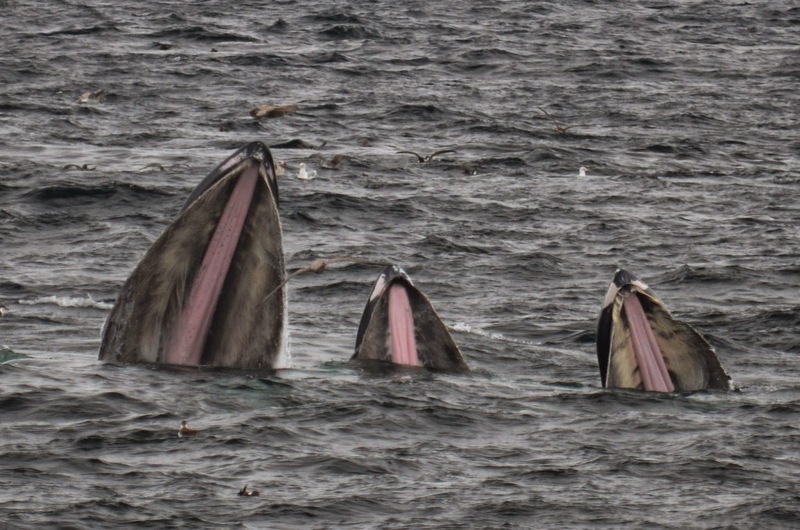 Next, a group of four whales including Pleats, Octave, Hatchmark and Perseid repeatedly fed with bubble nets. Perseid’s calf and Storm, both solo, were swimming nearby. Our final group was another bubble net feeding group including Milkweed, Aswan and a couple other whales. Finally, I am happy to report that our entanglement victim from yesterday, Milkweed’s calf, was happy and healthy and apparently gear-free. This young whale displayed some flipper slapping and play kickfeeding but never surfaced with a mouthful of fish like the adults. Soon enough, however, this young calf, becoming increasingly independent, will separate from his mother as their feeding season comes to an end. 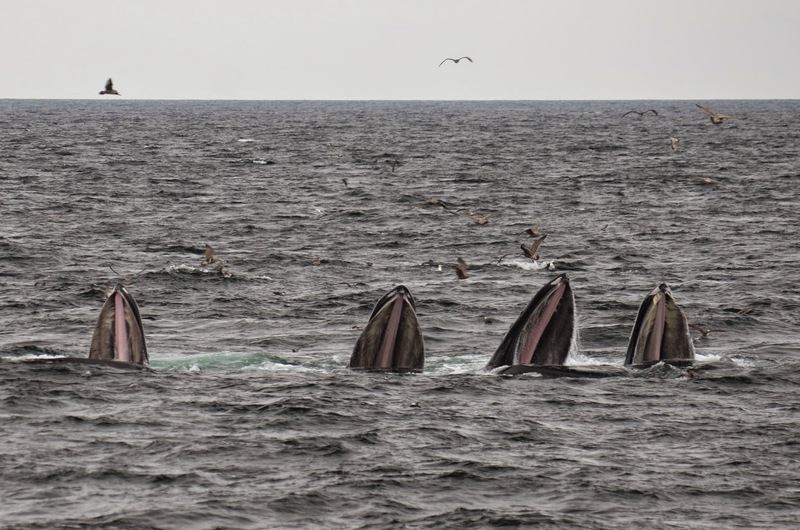 Overall, we had another incredible whale watch on Stellwagen Bank! !